We will be closing our doors on May 4th to begin our renovation and transformation!!! When Kensington Café re-opens it's doors on Friday, May 22nd, we will be beginninging a whole new "cafe" experience to the wonderful neighborhood of Kensington. 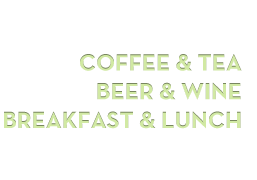 We will continue to offer good coffee and a neighborhood coffee alternative, but will also be offering a whole new full-service breakfast and lunch cafe menu; as well as serving beer, wine, small plates and desserts for our evening customers. Until then, please visit us for coffee, tea, breakfast, lunch, beer, and wine. We still offer great food and coffee. The re-model will just be the next step in trying to bring a comfortable and friendly neighborhood meeting place and dining experience to Kensington and San Diego. Check back while we are renovating for updates and photos!! Please submit your email address for more information our re-opening.